Mobile games dominate the charts when it comes to top grossing apps, but that popularity also breeds a lot of competition. Tylted, the games publisher recently rebranded from Cellufun, wants to tap into that opportunity with GameDrop, a new kind of distribution network that taps into existing ad platforms to provide in-app gaming overlays, with Pandora one of the first app publishers signed on to work with it. Tylted is also testing the format with other content: it also ran a smaller trial in Pandora’s app with Beintoo, a rewards/loyalty platform, which served out deals to gamers when they reached milestones playing games through GameDrop. Those had a conversion rate of 4%. Tylted — which publishes social games, digital board games, brain games and casino-themed games and has 10 million monthly unique visitors across them — says that it has applied for patents to cover this technology, which it says can work on any platform, and on any device. But for now, GameDrop only works on native, not web, apps. To see if and how this would work before releasing it for other games publishers, Tylted trialled the service on its own content in October: it ran a campaign for its Cubugs game across Pandora’s iOS and Android apps. Across 45 million impressions, Cubugs picked up an additional 800,000 registrations and 10 million minutes of playtime. 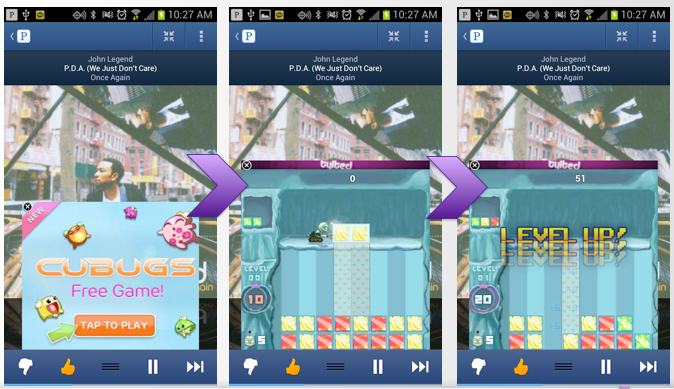 Lon Otremba, CEO of Tylted, says that the trial was successful enough to get Pandora to sign on as a partner for GameDrop’s commercial launch. He says that several other large-scale publishers have also signed on, although their names are not yet being made public. As for games developers, there Game Drop is launching with 8 of them, in addition to those Tylted publishes itself. That number, Otremba says, is likely to be up to 20 by the end of this year. Tylted is now “aggressively” expanding GameDrop by building more partnerships not just with publishers and game developers, but also advertisers. Indeed, the latter category could become one of the most lucrative, given the investments that brands have made in mobile games to drive more awareness of their products (Coca Cola being just one). Nevertheless, given that users often click on mobile ads accidentally — the screens are small, our fingers are big — an expanding game might seem a little too invasive for some. Otremba adds that this is easily avoided, either by trying not to click on the ad, in which case it remains a small banner, or by closing it if you do open it accidentally.